What You Need: Clean disposable clear plastic glove; popped popcorn; five red gumdrops or jelly beans; ribbon or yarn. 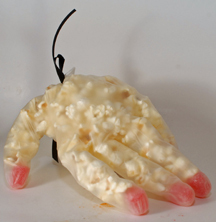 How You Make It: Shove one red candy into the tip of each glove finger and thumb. Fill glove almost full with popcorn. Tie shut (with adult help) to secure. Yum! This entry was posted on Monday, October 22nd, 2007 at 4:00 am	and is filed under food crafts, Halloween crafts. You can follow any responses to this entry through the RSS 2.0 feed. Responses are currently closed, but you can trackback from your own site.